In Windows operating system of Windows Vista and Windows 7, user usually press Alt+Tab or Win+Tab keys to switch and change between various opened program windows or tasks. The difference between Alt-Tab and Win+Tab keyboard hotkeys is that the prior is using classic 2D switching UI which exists since Windows 9x era, and the later allows user to change to another application window easily by showing Flip 3D Aero live snapshot or thumbnail preview. The similar thing is that both keyboard accelerators allow user to switch between windows, and will quit or exit itself once the keys are depressed, returning focus to a selected application window or desktop. For user who want to slowly review which application window or task to switch to, it’s possible to trigger and activate the task switching user interface, and hold the state until user click on any of the thumbnail or live preview to switch to. To do so, press and hold Ctrl key, and then press Alt+Tab or Win+Tab. The window changing user interface will suspend and remain, even if the keys pressed are released. When the windows switching UI stays, use Tab and Shift+Tab keys to move forward or backward among all the windows. 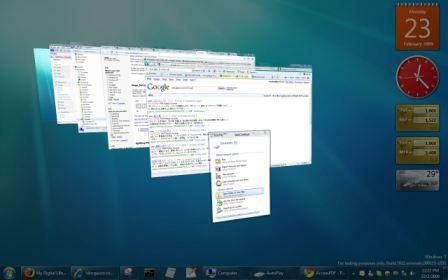 Alternatively, just scroll the mouse wheel to browse through the opened windows. To exit, just click on any window or press Escape key. Check out also more keyboard shortcuts for Windows XP, keyboard shortcuts or hotkeys for Windows Vista and Windows 7, in particular new keyboard shortcuts in Windows 7.